The touts are the first clue as they alternately wave clipboards of their guest houses (“need room? cheap cheap!”) and hand out fliers for the myriad tours that one can pick up on the island. I hadn’t even hit dry land yet, and I was already suspicious of what Phi Phi might turn out to be. 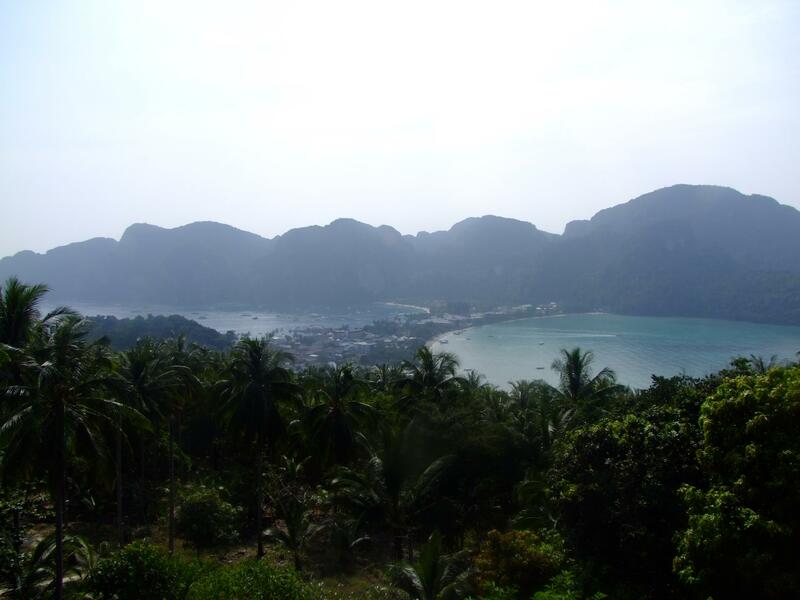 In essence, Phi Phi is a stunningly beautiful place, with white sandy beaches and languid blue seas kissing the shore beneath lazily drooping palm trees. 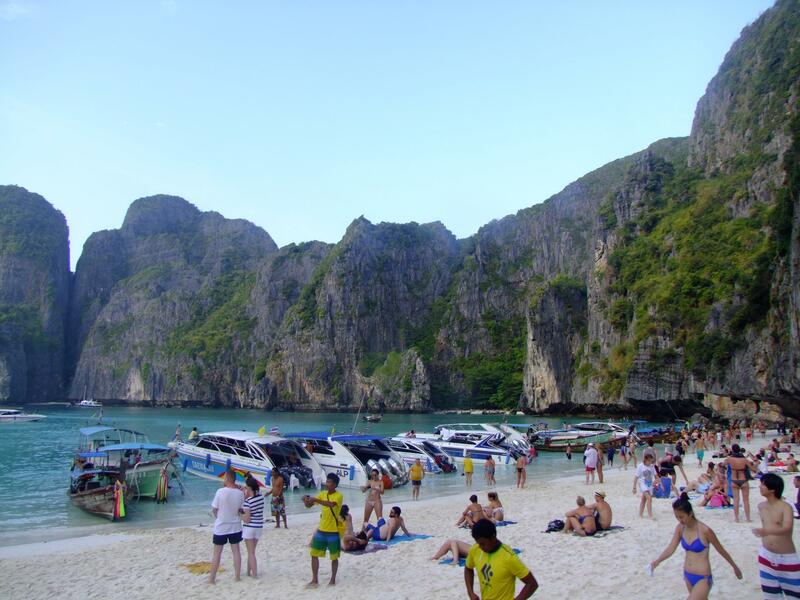 A vast majority of backpackers visiting Phi Phi do not experience this side of the island, or if they do, it is for a day trip only. I tragically have to report that I am one of them, as most of the island that was once a bungalow or two on an empty beach, is now a hot spot for luxury hotel resorts, and without much in the way of transportation (except for the long tail taxis that are expensive and unreliable), if you aren’t confined to your golden cage, then you are likely in the main village of Tonsai (different in every way from the place of the same name I mentioned in the previous post) and you quickly find out what kind of a place Phi Phi has become. The food is the first clue, with tired looking slices of pizza displayed along the narrow streets, burgers and sandwiches doing the rounds. Or maybe it’s the people walking around, most of whom are still drunk from the previous evening, fresh tattoos still covered up that they may or may not remember receiving. In short, this is a party island and while there is nothing wrong with a bit of a party, my main annoyance is the crowd that this attracts. They come in many forms; “bros”, “lads” or just good old fashioned arseholes. A group of Russians managed to get the whole beach shut down one night because they got in to a fight with some Thais (pro tip: never fight Thais). Plenty of nice people too obviously, but the boorish drunks tend to be noisier and sleazier than the rest. Yes, I am cynical. Yes I am being entirely snobbish, I know. I am going to be one of those awful bores who wistfully dream of the “good old days” of backpacking in Thailand when it was just a few mellow people, a gentle aroma of marijuana and couple of dreadlocks here and there. I was hoping for more of Tonsai, but instead I got Magaluf. That all said and done, when in Rome, do as the bros do. Buckets of local rum and coke? Why not. Watching a load of farang get in to the Thai boxing ring and attempt to beat each other up? But of course. Joining in with the fire shows and getting caught by a flaming skipping rope? Well… maybe not. Dancing outlandishly? I can do that. Behaving in a manner on the dance floor that just about counts as sexual harassment? Okay there’s the line. 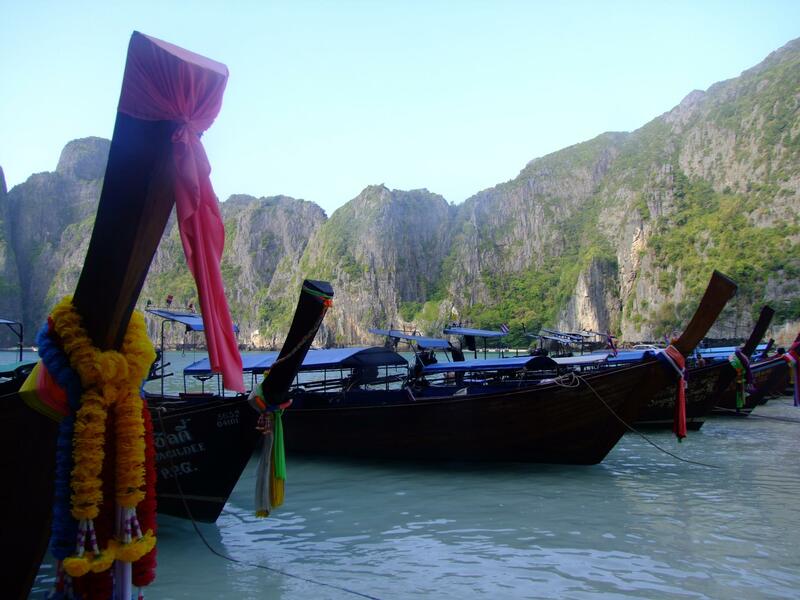 Maya bay is the famous starlet of Phi Phi, but she has been over done like a botox addled celebrity. Of course the scenery hasn’t changed, but the sheer number of visitors do detract from the experience a little bit. It’s not too hard to get a photo of the cliffs without the crowds and the endless boats, but when you are there the paradise that Danny Boyle captured and made famous isn’t quite as perfect as you’d have hoped. Still, you have to go at least once, and many people love it, and if you have money to burn and/or are well prepared, you can make the effort to avoid the worst of the crowds by going very early in the morning, or maybe stay on one of the very small number of boats that are permitted to remain overnight in the bay. Phi Phi was to be the last stop on my Andaman coastal odyssey, so I headed over to the Thailand Gulf coast to the Big Three islands, Koh Samui, Koh Phangan and Koh Tao. It’s perhaps worth mentioning that travelling in this part of the world is the easiest I have ever experienced. You get picked up from your hostel, you get the boat and bus tickets all included and the whole things is so smooth as to be, quite frankly, easier to do than at home. So it was, that after 8 hours of travel, I reached the coast of Koh Samui, an island that travel agents the world over will know well. This is not a good thing. 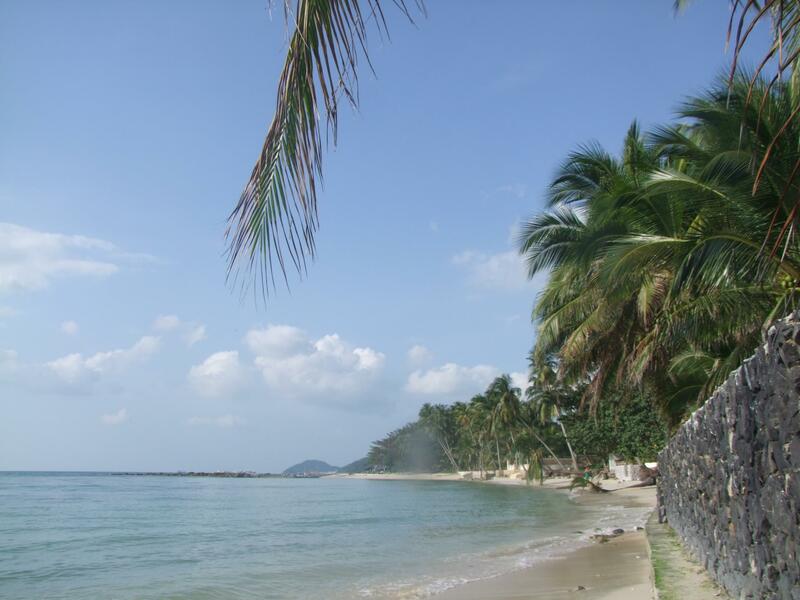 Samui is the largest of the three islands on this side of Thailand, and has been developed immensely over the years. A well paved ring road runs around the whole island, allowing the entire land mass to be accessible to hotel developers, so there is very little coastline that has not got a big white resort laying on it, bulging with bulging Russians. This is not your backpacker paradise and prices are inflated the island over. I was fortunate that I was staying in what might prove to be the most pleasant hostels of my trip (Ananas Hostel), but much of the charm of the place was in its remoteness from the bustle of the main towns of Chaweng (just awful) and Lamai (marginally better). Hiring a scooter and circumnavigating the island will give you a good idea of how over touristed this place has become, and the chubby unthinking clientèle on the beaches only enforces this. Despite this depressing summation, I was lucky to meet some nice people at the hostel, and on one occasion managed to drive to the south west and find myself a deserted stretch of sand to lounge on for a while. Not all is lost on Samui, but you have to put in the effort to find what remains of this ex-paradise. 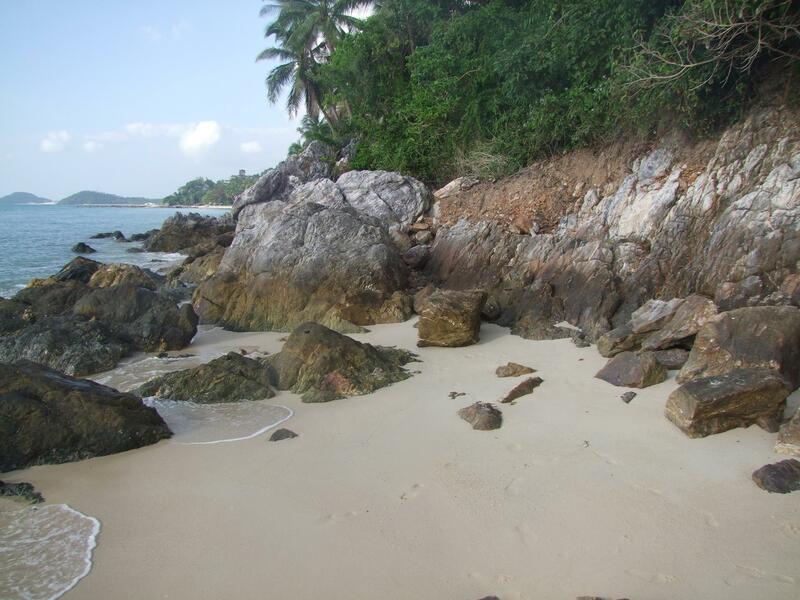 This entry was posted in Islands and tagged backpacking, island, koh samui, samui, Thailand, tourism, travel. Bookmark the permalink. Agree on the PhiPhi part! Lanta was nicer.. 😉 Good travels Harry!